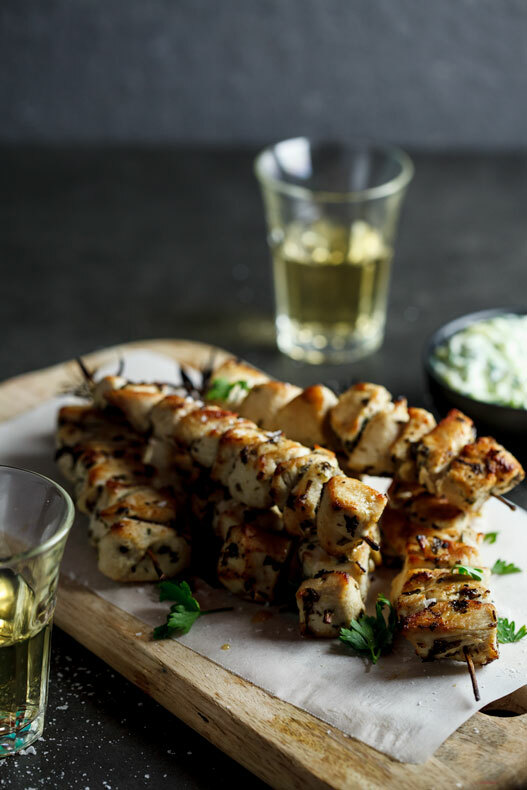 Lemony, garlicky chicken Souvlaki on rosemary skewers with creamy zucchini tzatziki is an easy healthy dinner recipe for your family. As a little girl (and teenager), I was always amazed at how adventurous my mom was for someone who never traveled abroad. She would wear kaftans with exotic prints on them while the other moms at school would wear twin sets with jeans. She would wear huge pearl and gem stone rings, wear her very curly hair naturally and wear her glasses with pride. I loved that she was the smartest person I knew (with a doctorate in criminology) and that she not only wrote books on terrorism but that she worked with the police in many instances. I always liked that her mouth was big and that the laugh that came out of it was genuine and loud. But the thing that I liked most was how she loved the food from countries around the world. She was one of the first to visit the very first Sushi restaurant that opened in Pretoria. 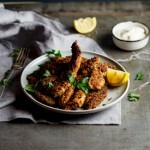 She would add peanut butter to chicken dishes because she had seen something similar in a Thai restaurant and she would make stir-fries to which she added a whole range of exotic condiments she found in the shops. But the cuisine my mom loved the most was that of the Greeks. If my dad wanted to spoil her, he told her to phone the Greek restaurant and order a few platters for dinner. She would do so with great enthusiasm ordering things I couldn’t even dream of pronouncing. 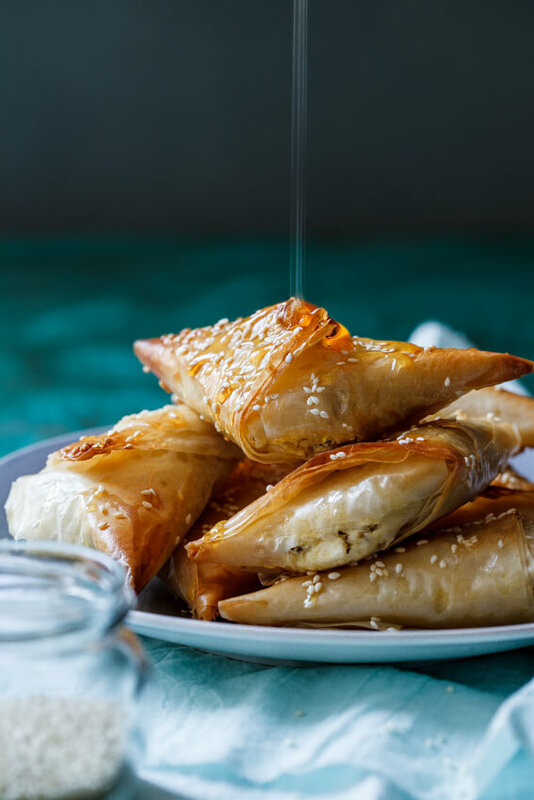 I was alarmed at the sound of Spanakopita at the beginning as it sounded too much like “spinnekop” (spider in Afrikaans) to my liking. I loved saying “dolmades” and “tzatziki” and “taramasalata” remains one of my favourite words of all time. The platters would arrive and my mom would start eating with her hands. Breaking the pita bread and scooping the delicious sauces and dips with the pillowy bread. She would squeeze lots of fresh lemon over the crispy calamari and the pleasure she was taking from the food was infectious. Soon, I myself fell in love with Greek cuisine. And to this day it is still one of my absolute favourites. Something that saddens me is that my mom never got to go to Greece. It was the only place she ever dreamed of visiting. I think a lot of that came from Shirley Valentine being one of her favourite movies, But I’ve always vowed that I WILL one day visit Greece and I will soak it all up for my mamma. So, after all that it can’t come as much of a shock that this is one of my favourite meals of all time. 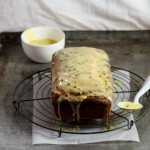 In fact, anything super lemony and garlicky served with tzatziki is pretty much right up there with my other favourites. Souvlaki is traditionally pork that you skewer and marinate in lots of lemon, garlic, herbs and olive oil but I find I prefer chicken or lamb more. I used a lot of herbs for this, some that might not be traditionally used in Souvlaki but I think they give great flavour. I also decided to use woody rosemary stalks instead of wooden skewers simply because they impart even more flavour AND they look completely adorable. I used zucchini for the tzatziki because I forgot to buy cucumber. It really is as simple as that. Zucchini is great to use in tzatziki as it’s not as watery as cucumber so your tzatziki will be a LOT creamier without all the fuss of draining for hours, etc. If you’d like to try a traditional cucumber tzatziki however, have a look at this how-to video. Chop each chicken breast into 8 bite-sized chunks then place in a ziploc bag. Add all the marinade ingredients, seal the bag and allow to marinade for at least 20 minutes but up to a day. When you are ready to cook the chicken, thread 8 pieces onto each rosemary sprig then grill in a hot griddle pan until cooked through. To make the tzatziki, combine all the ingredients. 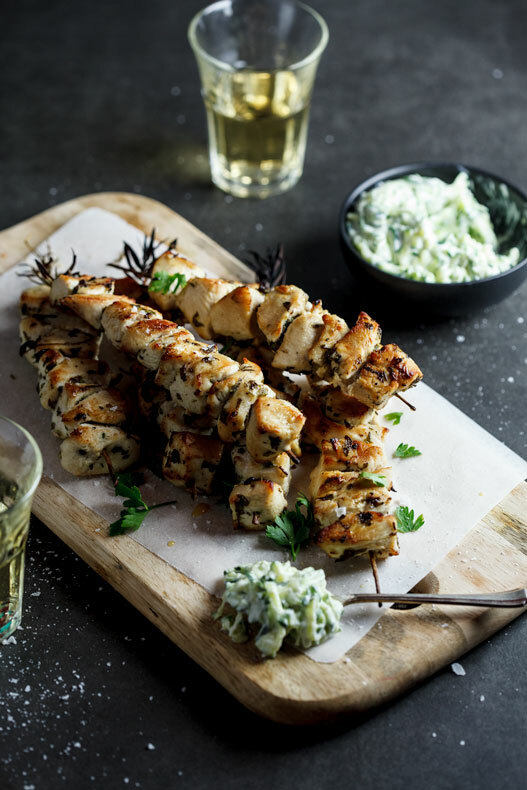 Serve the cooked chicken souvlaki with the tzatziki and warmed pita breads (optional). I can’t wit to make this recipe! I absolutely love the stories about your mom! I hope you like the recipe Denise! 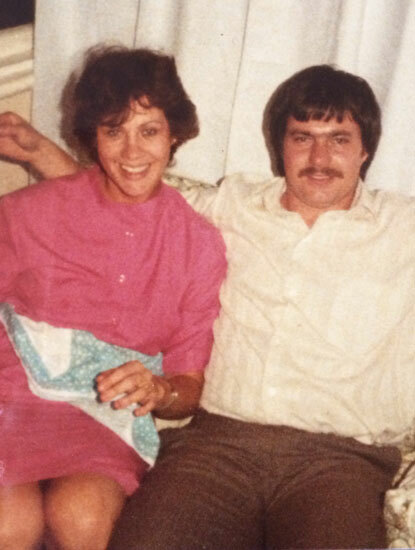 A wonderful story about your mother – I share her interest in cuisines from around the World. 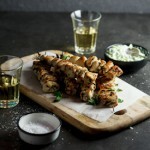 A friend of mine is married to a Greek woman, she makes fabulous kebabs like these for summer barbecues – I’ve never seen a recipe for them though. I can’t claim that this is a traditional recipe but it definitely is absolutely delicious and tastes almost exactly like the souvlaki I’ve tasted from Greek restaurants in my hometown. I loved your blog today and the wonderful story about your mom. She must have been a vibrant and accomplished person! 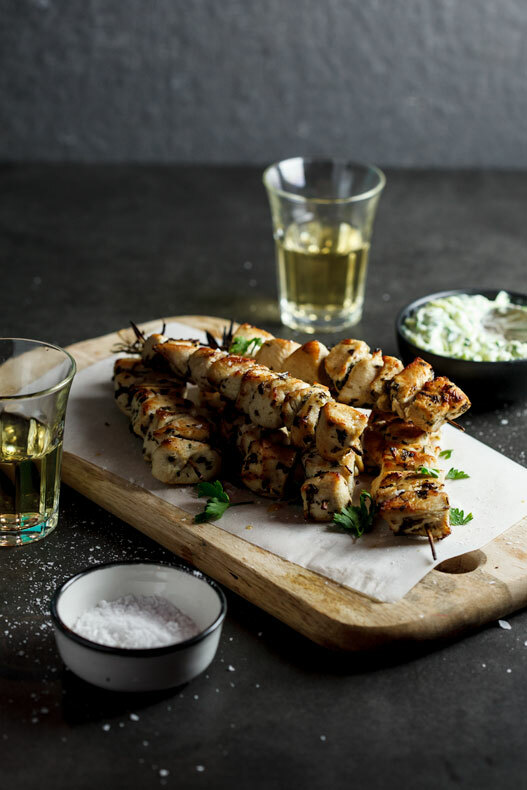 As for the recipe, I adore chicken souvlaki, but have never made it. We used to have a great Greek diner nearby that served a huge souvlaki platter, but sadly, they closed about a month ago. So armed with your recipe, I shall try it myself. 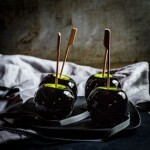 Thanks, too, for your always inspirational photographs — works of art, one and all. Cannot wait to try the souvlaki; I also want to try my hand at a moussaka. 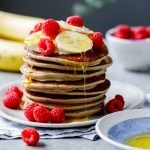 Thanks again for your fabulous blog (and cookbooks)! Thanks for your lovely comment Sune! Beautiful pictures and brilliant idea to sub zucchini for cucumber! 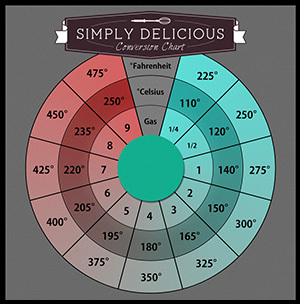 I will be filing this in my recipe box for low carb ideas! 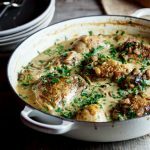 I love Greece and Greek food so this recipe looks amazing – I might just have to try it! 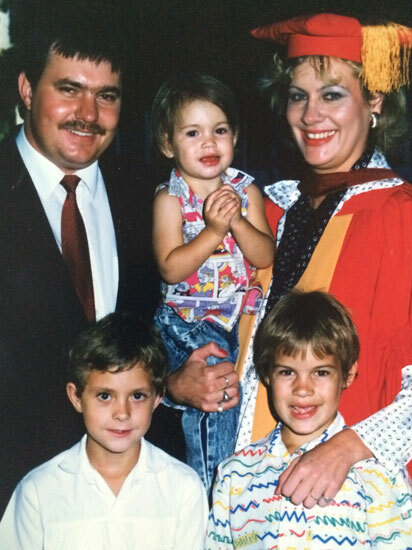 Really enjoyed reading this post, lovely memories of your childhood!